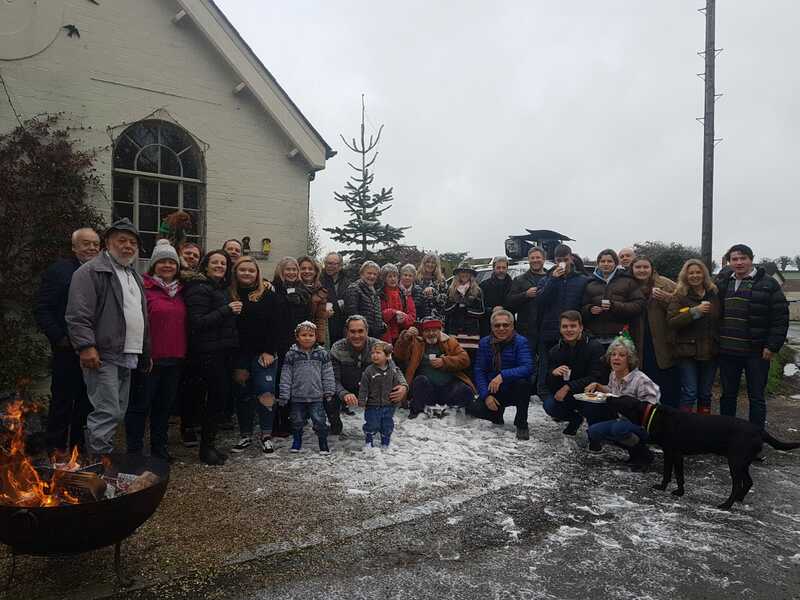 Bring your cherished car(s) to the Langton Arms in the field outside the church, from 10.30 – 11.30am Sunday 23rd. We are planning to meet up at 5.30 p.m. on Sunday 16th December, just before the Carol Service, to sing a couple of verses in German and English of two German carols (words below), with the approval of the PCC. We’re commemorating the renewal of the crosses of our German soldiers but also remembering our English Tommy who is buried nearby. Please do join us on your way to the Carol Service, either to sing (a good warm up for what follows) or just to be there. Dress warmly and bring a flashlight (if you are singing), the words below, and umbrella if necessary. No Glühwein but I may be able to supply some Lebküchen! It should only take 10 minutes and we should be in good time to get a seat in the Church for the Carol Service…. Our village handyman, Darren Shepherd, has transformed our telephone kiosk into a thing of beauty once more. Notice the gold paint on the crowns. Thanks to Gerard & Shirley Wyllys for cleaning the interior and Ron Stanley for replacing the broken glass panes. 9th Dec. 9am. Holy Communion BCP. We are decorating the church on Saturday 15th December at 10.00am. Everyone welcome to join in. The Splash is running once more. Did someone turn the taps back on? We are pleased to report that the Curry Lunch on 11 November in Tarrant Monkton & Launceston Village Hall raised the total sum of £885.00. Donations have been made of £590.00 to ABF The Soldiers’ Charity, and £295.00 to The Royal Marines Charity. Special thanks to Kate Graeme Cook who made a cake for auction, John Goode for creating postcards of the Tarrant Valley Quilters’ display of poppies at the Splash and to those who sent donations. Many thanks to all who supported this worthwhile event. 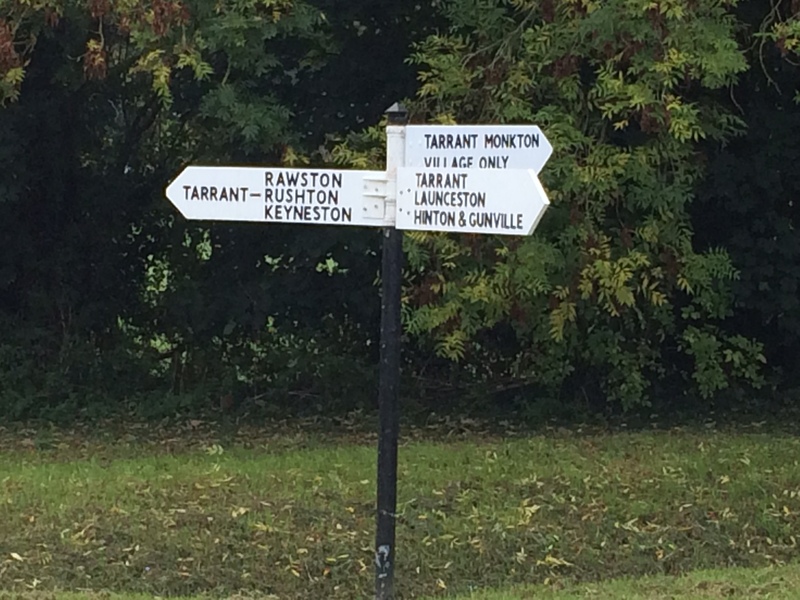 Those of you with keen eyesight may have noticed that the village signposts have had their ‘fingers’ renewed. The signpost at the southern T-junction, between Apple Tree Cottage and Guppys Cottage, has had all 3 fingers renewed. One finger had to be completely replaced, with new wood and metal letters (organised by Gerard Wyllys). The other two were repainted and letters replaced, by James Mallett and Richard Bowen. The north-pointing finger of the signpost at the Splash was repainted and letters replaced, by Brett Townsend. These works were approved and organised by the TM&L PC. Many thanks to the 4 skilled villagers. Now we know where we can go! A short ceremony of remembrance will be held at 11.00 am on Remembrance Sunday at the Tarrant Monkton War Memorial, at which a bugler will play the Last Post and a wreath laid. The purpose of the ceremony is to remember not only the sacrifices of the past, but also to honour those who have been killed in action much more recently. This year is of special significance, being the 100th anniversary (to the day) of the Armistice that ended the First World War. We very much hope that you will be able to join us at 10.50 am at the War Memorial on Sunday 11 November (after the 10.30am Commemoration Service in the village church) and for the Curry Lunch afterwards at 12.15 pm in the Village Hall, in aid of ABF The Soldiers’ Charity and the Royal Marines Charity, who are doing so much today for our injured servicemen and women. To mark the 100th anniversary, lunch will be followed by a short film about what actually happened on the final day of the ‘war to end all wars,’ followed by some readings of letters and poems written at the time. Tickets (£12 per head) for the Curry Lunch (bring your own drinks) are available from either of us. The majority of the proceeds will be divided between the two charities. Please let either of us know if you would like to attend by Wednesday 31 October and we will sell you a ticket – do try and come!